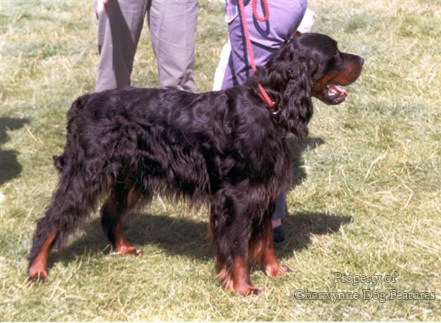 Many of our native breeds of dog have their origins or their development linked to the great houses of Britain, as the very names of the Gordon Setter, the Blenheim Spaniel and the Clumber Spaniel reveal. A number of our foxhound packs are also closely associated with country seats, as the Belvoir, the Berkeley, the Cowdray, the Duke of Beaufort's, the Duke of Buccleuch's and the Percy illustrate. Not surprisingly the breeds most favoured in this way were usually those supporting the sporting pursuits of the nobility. Scenthounds and gundogs have long enjoyed such patronage, whereas humbler sporting groups like the terrier rarely have and working breeds like the sheepdogs just about never. This has perhaps led to some breed-types becoming recognised and others fading away. If you take the setter breeds, we could so easily have ended up with rather different titles for the surviving breeds. At various times in the last century, the liver and white setters of Naworth Castle, Featherstone Castle, Edmond Castle and Melmerby Hall near Penrith were much respected. 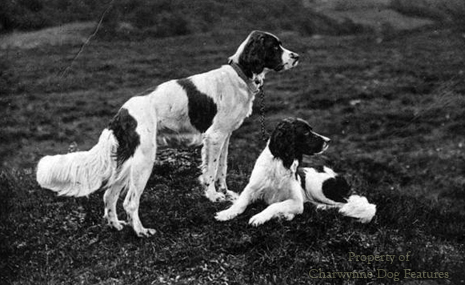 The black, white and tan setters of Lord Lovat of Beaufort Castle, Invernesshire, of the Earl of Seafield at Urquhart Castle and of the Earl of Southesk in Forfarshire were once as well known as those of the Duke of Gordon. Lord Ossulston of Chillingham Castle and Lord Hume of Tweedside favoured jet black setters. The Marquis of Breadalbane of Taymouth Castle, Perthshire would only have black greys or flints, as they were known. The blue Belton variety of the English setter could so easily have been named after the Duke of Argyle in Inverary Castle or the Marquis of Bute in Rothsay Castle, both of whom favoured them. 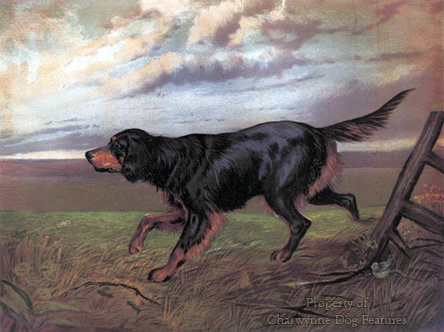 We have English, Irish and setters from Scotland as breeds today, but no Welsh breed, perhaps because the old Llanidloes setter did not find favour with a titled patron. 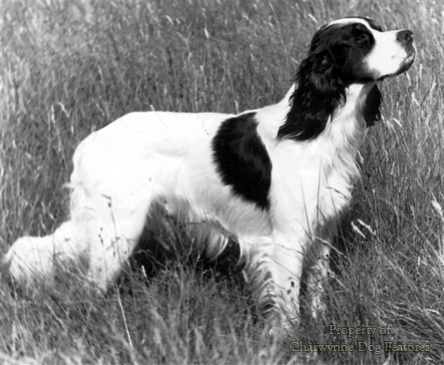 Described by the great setter breeder Edward Laverack as "a very ancient and well-known breed...milk-white or, as it is called there, chalk-white...but I am sorry to say it is dying out." Had it survived it would have been a valuable asset to the setter gene-pool and a credit to Wales. Perhaps a Welsh patriot with shooting interests and land to support them could now revive such a distinctive breed. Sadly today's landowners have little interest in our native breeds. At the start of this century, the Kennel Club's stud books were well furnished with the names of titled owners, owners based in fine houses. The King was patron of the club, with the Duke of Connaught as president and, as vice-presidents, the Duke of Portland and Lord Algernon Gordon-Lennox. Queen Victoria and Prince Albert had exhibited many pedigree dogs, making popular breeds such as the Skye terrier, the Pomeranian, the Pekingese and the rough collie. King Edward VII was a breeder and exhibitor, with his chows, Skye terriers and basset hounds all being shown successfully. The Countess of Aberdeen also promoted the Skye terrier and Lady Alexander owned several champion smooth collies. The favouring of Pomeranians by Queen Victoria led to the breed becoming the most popular toy breed until surpassed by the Pekingese. Princess Sophie Duleep-Singh championed the black Pomeranian with some success. The pug attracted the attention of Lady Brassey and Lady Willoughby de Eresby, with the Japanese spaniels, as they were then called, being favoured by the Countess of Malmesbury, the Countess of Wharncliff and Lady Reid. The Duchess of Newcastle exhibited foxterriers, whippets, borzois and the breed developed at her country estate, the Clumber spaniel. Mastiffs, perhaps through a combination of their guarding qualities, majestic appearance and nobility of character, have long been associated with great houses, with those at Lyme Hall gaining the greater fame. The royalty and aristocracy of Europe liked to have their portraits painted with their mastiff-like dogs, as the Batoni portrait of Sir Harry Fetherstonhaugh, the Della portrait of Kaiser Ferdinand II, the Van Dyck portrait of the children of Charles I and the Velasquez painting of Las Meninas illustrate, the latter featuring a cropped-eared Spanish mastiff, a breed still existing today. Eminent owners and their historic houses crop up again and again when the development of today's mastiff breed is researched. We can read of the Earl of Oxford's dog 'Lion', the Marquis of Hertford's 'Pluto', Lord Waldegrave's 'Turk' and 'Couchez', Sir Fermor Hesketh's 'Nero' and Sir George Armitage's 'Tiger'. As well as the better known Lyme Hall strain, we can discover an old line of pure "Alpine mastiffs" (probably smooth St.Bernards) at Chatsworth and references to mastiffs at Elvaston Castle near Derby, Hadzor Hall near Worcester, Trentham Park near Stoke on Trent, Bold Hall in Lancashire, Esthwaite Hall in the Lake District and Nostell Priory in Yorkshire, Lord Stanley's dogs at Alderley and Athrington Hall's 'Lion'. The inherited sense of sporting history in the blood of such dynasties so often led to the stables and kennels being a prized feature of the family property. The architectural importance of purpose-built kennels such as those at Croxteth Hall in Liverpool, Elvaston Castle and Lyme Hall is now acknowledged. The fact that such kennels no longer have dogs in them is disappointing. It is encouraging to know however of the interest of the National Trust in the revival of the Lyme Hall mastiffs, rather as the Danes are reviving the Broholmer, or mastiff of Broholm Castle. This would be a most worthy project and a chance perhaps to produce a more traditional example of this distinguished British breed than seen in today's show rings. I understand that most of the collection of paintings from Lyme Hall went to America but believe that Chatsworth and Nostell Priory retain the collars of their mastiffs. So many of our stately homes' owners of today are unaware of or indifferent towards the rich canine heritage behind their properties. Where are the successors to the Dukes of Gordon and their setters, the Dukes of Newcastle and their Clumber spaniels and Dukes of Marlborough and their toy spaniels in today's dog world? Where are the likes of the second and third Earls of Malmesbury, the fifth and sixth Dukes of Buccleuch and the eleventh and twelth Earls of Home, who had the vision to see the sporting potential of the Labrador retriever, now our most popular breed of dog? The Earls of Malmesbury lived at Heron's Court, only four miles from Poole, where the ships came in from Newfoundland. They soon realised the value of the black, biddable seal-coated ships' dogs which came ashore there. Would we ever have had the charming golden retriever without its early patronage by the first Lord Tweedmouth and the fifth Earl of Ilchester on their country estates? How I wish the Earl of Lauderdale had persevered with his 30lb pointers of 1810, the Duke of Kingston had lent his name to his renowned all-black pointers, the Dashwoods of Huntingdon Court in Herefordshire had preserved their Llanidloes setters and the Viscounts Melville of Melville Castle had retained their interest in the much-neglected curly-coated retriever. In the terrier world, if the black and tan rough-haired terriers of the Earl of Macclesfield had been conserved, we might still have an English terrier by name. How we miss men like Squire Donville Poole of Maybury Hall, near Whitchurch, Shropshire, who kept alive the blood of the old Cheshire or Shropshire terrier, with his handsome pack of Belvoir tan dogs. It would be encouraging indeed to see the old name of Prince Charles spaniel restored to the tricolour version of the Cavalier King Charles spaniel and then favoured at Highgrove. The Spencers of Althorp allegedly gave the Duke of Newcastle his first spaniels, allowing him to create the Clumber breed. With the working Clumber being resurrected by some very worthy sportsmen, how stimulating it would have been if the sadly-missed Princess Diana, the most prominent Spencer of recent times, had lived long enough to lend her name to such a worthy renaissance. With the Earls of Shrewsbury no longer at Alton Towers, the re-creation of the Talbot hound is not likely. But the restoration of the 'pocket' beagles of George IV and the ten inch 'singing' beagles of Queen Elizabeth I to the royal kennels would undoubtedly be more traditional than the presence there of 'dorgis', the result of crosses between a corgi and a dachshund. Social historians can no doubt come up with all manner of reasons as to why the nobility gave up their leadership in this and other fields. But is it really too late? How marvellous it would be to see the Lyme Hall mastiff restored to the splendid kennels there. How refreshing to see the Elvaston Castle kennels in use again, perhaps to re-create the extinct English white terrier in the very heart of England. And how sublime to see truly distinctive dogs greeting visitors at every great country house in Britain, just as they used to.